Rhubarb is a strange and exotic plant for me. I had never seen or eaten it until I came to the States. 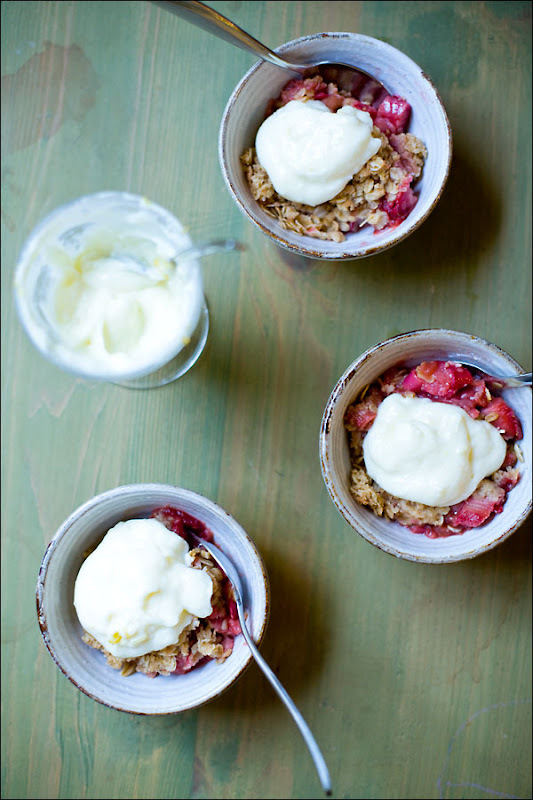 When I first had a chance to taste rhubarb crisp at a friend's house, I was expecting it to taste something like a nasty mixture of beats and celery. What a wonderful surprise, it was nothing like I imagined. I instantly fell in love its citrusy flavor. That was almost 10 years ago. Now I'm finally ready to cook with it for the first time. Yes, I loved the way it tasted, but didn't feel comfortable using it until now. There is a simple enough recipe in this book that inspired me to make this finally. I like that it has ginger in it. Such a great idea. I twisted the recipe a bit and added some strawberries. I also made some creamy cheesy topping, which I think was pretty clever to do. Preheat your oven to 350°F. Put the rhubarb, strawberries and half the sugar into a pan. Add the lemon juice and zest, put a lid on top, bring to the boil and simmer for a few minutes. Remove the lid and simmer for around 5 more minutes, until the rhubarb has softened slightly. Spoon into an ovenproof baking dish or individual dishes and spread out evenly across the bottom. To make your crumble topping, use your fingers to lightly rub together the flour and butter until the mixture resembles fine breadcrumbs. 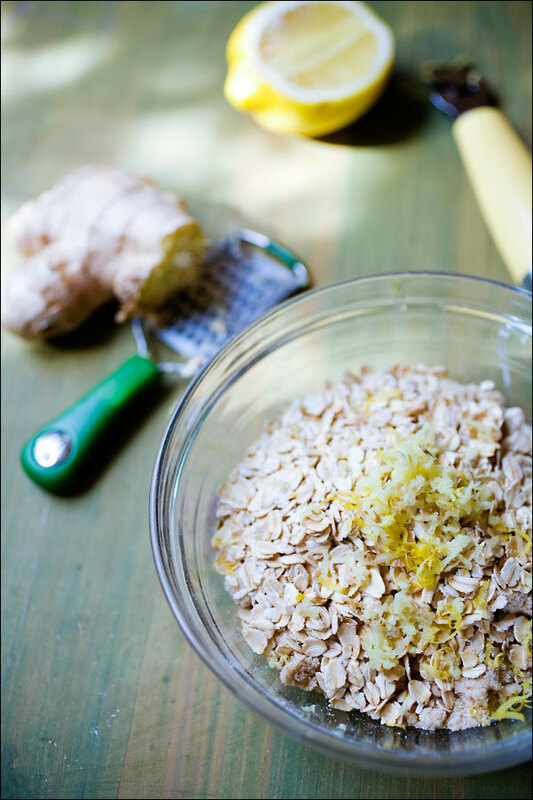 Stir in the oats, the rest of the sugar and the stem ginger. 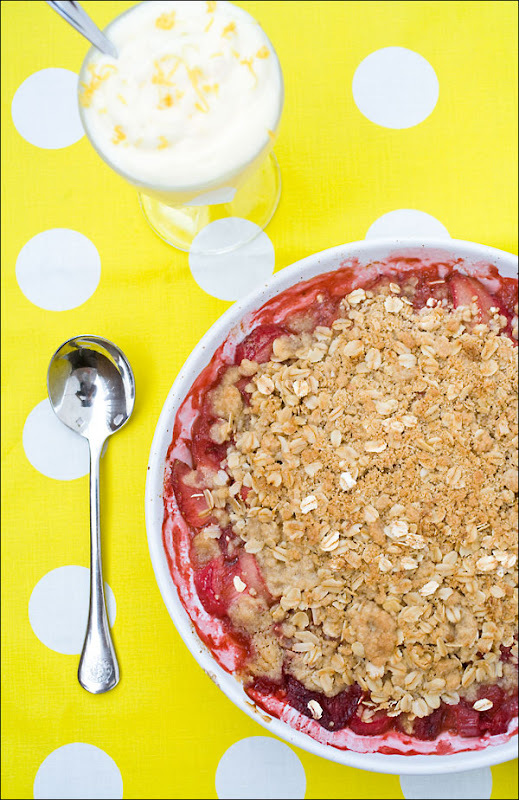 Sprinkle the crumbs over the rhubarb and bake in the preheated oven for 40 to 45 minutes, or until the rhubarb is bubbling up and the crumble is golden. Just mix them all and top it on the crisp! This looks really really good Manabe!